So, you've finally booked your hair and makeup trial, now what? Well, for starters, get excited! This is the fun part! Tip - Trial Runs should be booked 4-6 weeks in advance of your wedding date. We recommend booking your trial on a special day, so that you can show off your beautiful look. Many brides will book it on the day of their bridal shower, engagement shoot or bachelorette party. 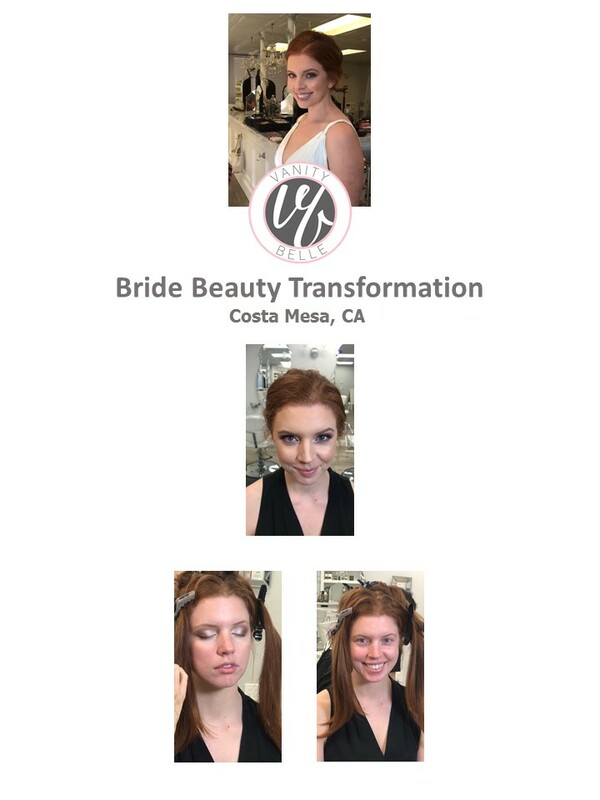 How do you prepare for your bridal hair & makeup trial? We've prepared a list of our best tips and pointers to set you up for a beautiful success! Photos, Photos, Photos! Start a Pinterest Board of your favorite looks. Once you've gotten a good board together, go through and find the similarities you like across the different photos to help narrow it down. Your makeup and hair artist(s) will discuss the photos with you in your trial and ask what you like and don't like about each one. Make sure to have an idea of the the details you like about a particular look. For example, you might like the eye liner but now the brows. Or you might like the volume of the hair but not the type of curl. Keep in mind too, that the person in the photo might have different features than you. If you are fair skin blonde hair, you probably want to stay away from photos of Kim K. Try to find photos of looks on people that share your personal traits. When searching for a bridal hair and makeup artist, it's extremely important to find an artist that specializes in bridal. Look at several photos of their work, so that you can get a feel for their style. You can also tell someone's personality through their social media. You will be spending several hours with your artist(s) on your wedding day, you want to make sure they are people you could vibe with. At Vanity Belle, we help you with this! Once you have your vision determined, we will be able to pair you with the best artist for your style. We'll have you complete a bridal trial questionnaire to help us prepare for your trial as well. We'll ask you questions about your wedding colors, your personal style, etc. Your should be clean and completely dry (washed the night before) in order to have the hair set properly and skin should be moisturized prior to the Trial Run; this will enable the makeup to go on smoother and last longer. Please do not wax your brows or receive a facial closer than 5 days prior to the event. The first thing you will do after you meet your artist is discuss your desired look. This is where you will show the photos you saved and talk through what you like and don't like about them. You will talk about everything from contouring, to the shape/color of your brows to the type of skin finish you prefer (for example - matte or dewy and traditional makeup vs. airbrush makeup). It's totally okay if you aren't 100% certain of your look, the artist's job is to ask the right questions and make suggestions. We just ask that you have are honest with us about your opinions. This is one of the most important days of your life, and we want you to look and feel like your most beautiful self. As the artist is applying the makeup/hair she will check in with you to make sure you are happy as things progress. As your artist is working away and you’re not liking what you see, it's super important to speak up! We know this probable sounds intimidating or scary for some brides, but communication is key! We want to know what you are thinking, it will help guide us in the right direction, and that's the whole point of the trial. Once your look is complete and you have approved, the artist will take photos and make notes so that we can replicate the exact look again on the wedding day. It's not a bad idea to take your own photos as well. Try out your look in different lighting - at home, outside, etc. and see how it shows up on camera. Now that you are glowing and beautified, keep your look in place for at least a few hours. You'll want to see how your makeup and hair lasts. If some hairs come out of place, or your skin gets oily, etc. these are things you'll want to communicate to your artist so that they can make modifications for your big day. Look at yourself in the mirror, take photos in different lighting, try on your accessories, etc. and really try to get a feel for how it would all come together. We all want approval of our friends and family, but getting too many other opinions can be overwhelming and can make you second guess your own opinion. If you feel beautiful, that's all that matters! Give your artist a call and let her know that you want more volume, tighter curls, heavier contour, etc. We can typically achieve any change you need. If it is a drastic change, we can definitely schedule a retrial if necessary. And remember, don't be afraid to speak up! This is your day, and we want it to be perfect.